It's Facebook Fridays! for March 15, 2019! Learn the magical cooking tricks of kitchen witches from around the world, and make fabulous foods with hoodoo-style seasoned herbs and spices traditionally used in magic spells for love, money-drawing, and spiritual protection. The Lucky Mojo Curio Company is holding a random drawing to give away 4 delectable and gustatory spiritual supply prizes designed to exercise subtle influence through cuisine. This week each lucky winner will receive a copy of "Hoodoo Food! 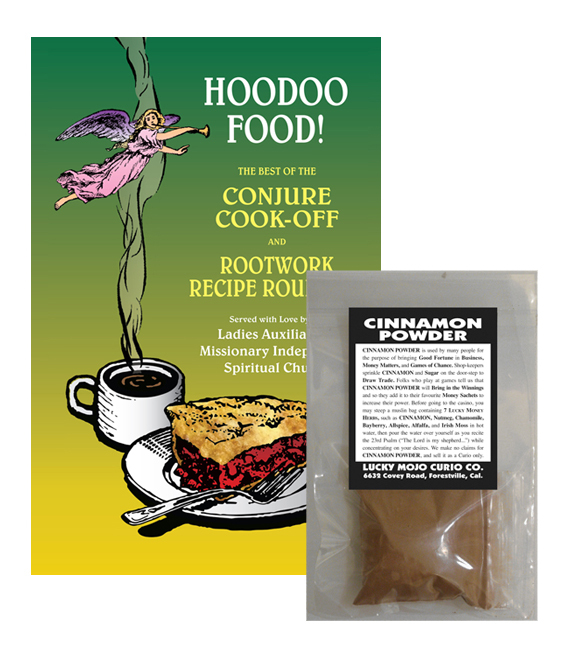 The Best of the Conjure Cook-Off and Rootwork Recipe Round-Up," along with a package of Cinnamon Powder, to add to food to improve your business and money luck. First thing tomorrow morning, we will select FOUR winners at random, announce their names here, and ask them to message the Lucky Mojo Facebook Page with their mailing addresses, so we can send them their FREE Hoodoo Food products. Hey, folks -- that's you cue! Head on over to facebook and enter your comment in the contest. Winers will be announced mid-Saturday. We have a winner! In fact, we have 4 lucky winners! Our Facebook Fridays! winners for March 15, 2019 are: Naomi Brown, Gina Lonay, DeLaine McCord, and Kittie Bernott.